Valiant is proud to present an advance preview of Harbinger #6 – the FIRST ISSUE of an all-new arc by New York Times best-selling author Joshua Dysart and fan favorite artist Phil Briones! Peter Stanchek has fought his first battle against Toyo Harada’s Harbinger Foundation, but the war is just beginning. “Renegades” starts now! Battered and broken after escaping the Harbinger Foundation, telekinetic teenager Peter Stanchek only has one option left: run. But he won’t have to go it alone. Crisscrossing America with the only two people he can trust, Peter will have to activate a new team of super-powered recruits before Toyo Harada and his Harbinger shock troops can reach them first. Peter Stanchek. Zephyr. Kris. Flamingo. Torque. Outside the law, inside your head – you’ve never met a team of super-powered teenagers quite like the Renegades. And, together, they’ll dismantle Harada’s global empire one brick at a time. 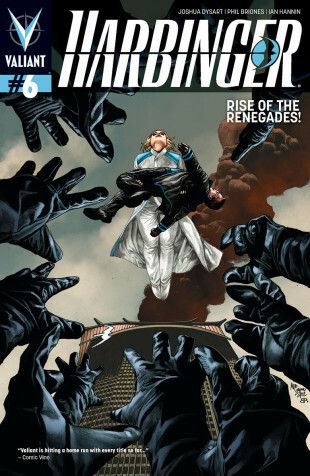 The Valiant Universe gains a whole new set of heroes in Harbinger #6 – a brand new jumping-on point for one of the year’s most critically acclaimed new series! And go back to the beginning on January 6th to discover Peter Stanchek’s induction into the Harbinger Foundation – and his fateful first encounter with Toyo Harada – in the Harbinger Vol. 1: Omega Rising TPB, collecting Harbinger #1-5! HARBINGER VOL. 1: OMEGA RISING TPB – ON SALE JANUARY 9th!